This is absolutely beautiful Sathya! I bet that was a nice hike too! I have never been to Oregon but I would love to go there and see all of these magnificent waterfalls! Hey Michael, it indeed was , this and the previous one are from the same day hike. Oregon is a lovely place, you definitely should plan. Just give a shout out when you are headed this way ! Thanks Sathya! The name came to me last year in September and I couldn’t believe nobody had already bought that domain! Thanks again :) Yeah this was from the same place too ! Beautiful long exposure. Well done. 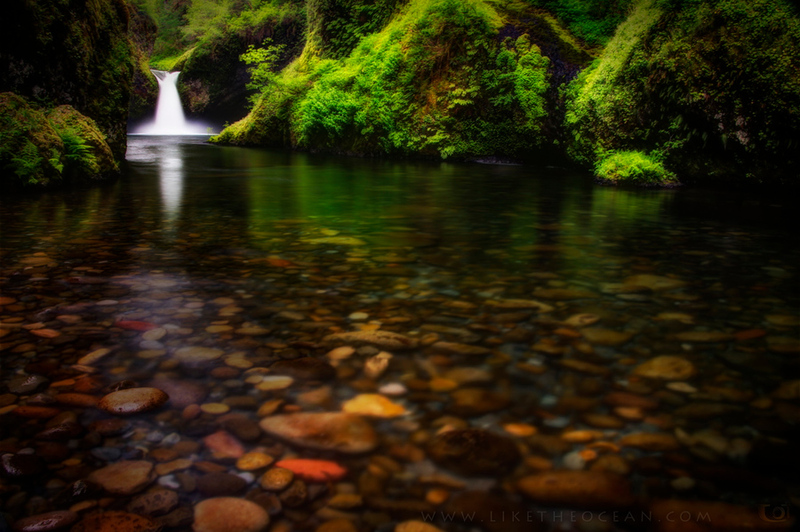 Really nice composition — I haven’t made it to this falls but now have to add it to my list. Well done. Thanks Nick. Yes this definitely is worth it. You can also take a look at metlako falls and the lower punchbowl along with this. If you are into hiking, you can make it all the way up to Tunnel Falls. So lovely, one can almost FEEL the peace and serenity of the place. Am glad I was able to capture the mood of the place for everyone to enjoy, thanks for the kind words Juris ! What a beautiful scene! This is a really great capture, I love the low perspective that you chose. Yeah getting in the water really paid off (it was biting cold, note to self: need to get some waders) , I too loved the way it turned out !